Tucked away between sheltered mountains lies the magical Ceres Valley, and it comes as no surprise to visitors to learn that Ceres is named after the Roman goddess of agriculture and fertility. This charming town has become world famous for its export-quality fruit, breath-taking scenery, warm hospitality and wonderful active and leisure options. Ceres is also the gateway to the Cederberg Mountains to the north and the Tankwa Karoo to the east and is a mere 150km or 90 minutes drive from Cape Town. Ceres, is for good reason named after the Goddess of Fertility, as it lies tucked away in a fertile valley surrounded by the majestic mountains of the Boland. Only accessed via mountain passes that will literally take your breath away, there are four unique areas to the town: The Warm Bokkeveld which has an abundance of natural agricultural resources and envelops Ceres and Prince Alfred Hamlet. The Bo-Swaarmoed which is situated at the foot of the Matroosberg Mountain Range and is famous for its seasonal snows and cherry farms plus the views of the Ceres Valley which are breath-taking. The Koue Bokkeveld is home to a small village but a number of large farming estates, and is world renowned for its apples, pears and vegetables. Lastly, The Ceres Karoo is a semi-arid desert area, boasting a long history and a unique culture including breath-taking landscape views and priceless natural resources. In winter snow can fall on the higher mountain regions, and this brings many visitors to the Ceres Valley, which has become affectionately known as ‘the Switzerland of South Africa’. In summer, the Ceres Valley offers a beauty all its own and there are numerous hikes, mountain bike tracks and walks along rivers and streams and in the surrounding mountains for those nature lovers. Alternatively, come and pick your own cherries during cherry season or go on a tractor or horse ride to experience real farm life! One of the region’s greatest assets is its sheer diversity of bird species, hosting highly sought-after endemic and near-endemic species found in the unique Fynbos vegetation. 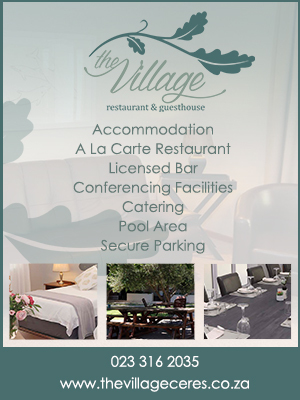 There’s a wide variety of accommodation ranging from luxury game reserves, a Cape Nature reserve, numerous guesthouses, bed & breakfasts, self-catering units, farm cottages and mountain & eco-huts, and a camp site within the town of Ceres. After enjoying a fun filled time out and about, why not take time out to relax and unwind at one of the many day spas or coffee shops. Our clean and clear skies will renew your mind, body and soul. 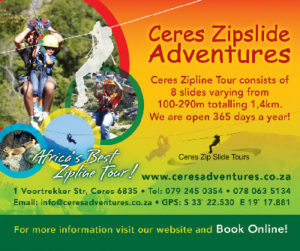 For those seeking a little adventure, Ceres has you covered and here, you can be adventurous. The best way to enjoy the stunning mountain landscapes and valleys that make this part of South Africa so unique, is by immersing one’s self in its splendid outdoors. From zip sliding over breath-taking rock formations, abseiling, ‘kloofing’ or ice climbing at the magnificent Matroosberg, riding the tough, exhilarating Tankwa Trek MTB or walk the Tankwa Camino – there is an adventure for everyone. Ceres also boats a stunning 9-hole golf course that is ranked as one of the best in South Africa. Be wild! Be daring! Have Fun! Mention the name ‘Ceres’ in South Africa and any local will immediately reply ‘fruit juice and apples’ and indeed, the Ceres district is one of the country’s largest deciduous fruit-growing regions and home to the factory that produces a fruit juice concentrate of the same name. Named after the Roman goddess of agriculture, Ceres, this valley produces an array of fruit and vegetables that feed many South Africans and service numerous international markets. Produce includes: apples, pears, nectarines, peaches, apricots, plums and cherries. Onions and potatoes are also grown in the Ceres region and we even have dried fruits and a local wine. Ceres is located at the north-eastern entrance to Michell’s Pass and was the old route north between Cape Town and Johannesburg, which was later replaced by the N1 highway. The “Togryers Museum” or Transport Rider’s Museum in the centre of town, honours the huge influence that the transport riders had on the development of Ceres. The completion of Michell’s Pass in 1848 made the town accessible to wagons, and one of the main routes to the diamond fields in Kimberley passed through Ceres. There are a number of ways to explore the exquisiteness of Ceres, but none quite as distinctive as the locomotive of the Ceres Rail Company. These locomotive trips run between the Ceres Golf Estate and Cape Town, where the lush green of the countryside is rivaled only by the once-in-a-lifetime opportunity afforded by the authentic locomotive experience. Come and enjoy nature at its best.